Hanson Sign Companies has been producing high-quality Plastic Sign Faces made from Solar Grade Lexan polycarbonate since 1988. Solar Grade Lexan prevents yellowing and is extremely durable. Our paint department produces the highest-quality painted plastic faces on the second surface. 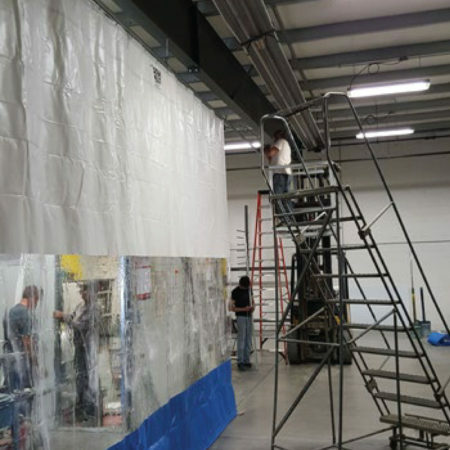 September of 2017 we installed a new curtain wall between our cabinet assembly and spray booth areas to improve our quality and on time delivery. As we have grown busier it has become an increasing challenge to move finished signs out of the paint booth fast enough so that others can be moved in. We had too many instances where signs had to be sanded down and repainted due to dust settling in the paint resulting in delays. Our new curtain as well as our switch to Mathews Paints will help eliminate this issue insuring better quality with fewer delays. Our Vacuum formed lexan faces allow for extremely brilliant, durable and creative applications customizable to your customer's needs. Pan embossed faces are similar to pan faces, but some or all of the copy may be raised. Dies are placed on top of the mold to create this effect. Embossed pans can cosmetically improve the appearance of the face as well as adding additional strength. Projected text results in a second dimension visually. Pan faces are an excellent alternative to flat faces. The face is vacuum formed to a depth of 2``. This gives more than just a decorative appearance to the face, it adds strength and durability. You may order white pan faces and apply your own translucent vinyl or you may wish to have us back spray the artwork in translucent paints so it will come to you completely finished. Pans also keep faces a sufficient distance from the cabinet bulbs to help avoid hot spots and shadowing.